Six months ago I blogged on Hope, Redemption, and Second Chances. I wrote about the new Potter’s House multi-author series I was part of and my first book in the series, Restoring Faith. Two weeks ago I released my second book in this series (which is book 14 in The Potter’s House Books as there are seven authors involved). 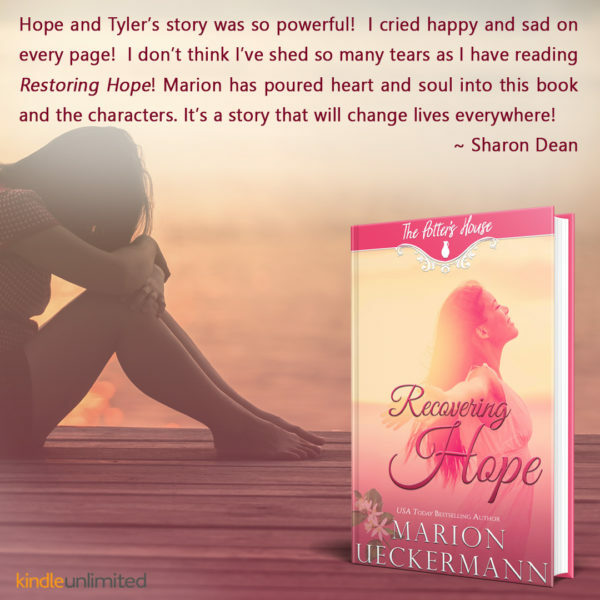 Recovering Hope was a difficult book to write—the subject matter hit home personally—but oh, all the blood, sweat, and tears (okay, no blood involved) was worth it because readers are loving it. The Potter’s House books wanted stories in the series with flawed characters in desperate need of hope, redemption, and second chances. A heroine struggling with depression was one of the stories I wanted to write because several women (and some men) in my family suffer from / or have suffered from depression—some closer to home than others. In some ways, Recovering Hope is their story. I constantly saw God’s hand guiding me in the shaping and writing of Hope and Tyler’s story. For example, I’d envisaged some of the epilogue quite differently. I had planned to finish writing the book one Friday night, but the final chapter’s last scene took much longer to write. As such, I had to put off writing the epilogue to the Saturday. That night as I tried to fall asleep, the idea I used for the epilogue which gave Tyler the platform he had to bring glory to God through their situation, drifted into my mind, and I knew why writing that epilogue had been delayed. There were other God-instances in my writing process. I hope you’ll grab a cup of coffee, a box of tissues, and snuggle up on your couch (or bed) to read Recovering Hope. I’ll be giving away an ecopy of Recovering Hope to three readers who comment on this blog. This is an amazing story, and I cried too…. because it is so worth reading for anyone! I was so taken by just how much truth you gave these characters, they truly came alive for me! Thank you, Paula. It’s easy to make characters come alive, when you’ve real life situations to draw from. Thank you, Kim. I hope you get to try my books. You bring hope through your writing. You reveal God’s redeeming love as the stories unfold. Praying for you. Virginia, your prayers are so greatly appreciated. Thank you for your kind words. I loved this book so much. It touched deep in my heart! Thanks for sharing it with us and being willing to write what God lays on your heart. Thank you, sweet Marylin. I’m so glad that you loved Recovering Hope. Thank you, Mandy. I hope you get to read Recovering Hope. Wow! This sounds amazing. Depression is tough. It’s in my family, too, and I’ve experienced some of it. I haven’t tried to write about it. I don’t think I’m quite ready for that, yet. Thanks for touching on a subject that presses down on SO MANY, Christians included. Thank you, Regina. I’m humbled tgat God has turned the ashes of real life into something beautiful in Hope and Tyler’s story. I hope you get to read it soon. This sounds like a very interesting storyline! I look forward to reading it! This sounds like a wonderful book. I would love to read it. All three of my adult children suffer from depression, but I do not, and it makes it very hard to relate to what they are going through. It is very hard to cope with their behaviors at times. Thank you for writing about a difficult topic. I’m so sorry that you have this cross to bear, Linda. It is very hard to see your loved ones suffering with this disease that’s so difficult to understand for the non-sufferer. It certainly helped me to remember not to take it personally, that it was the illness. And that I wasn’t alone in the battle. I hope you get to read Recovering Hope soon. I love a book that hits your emotional side. I can’t wait to read this. And I love a reader who doesn’t mind reaching for the tissues, Audrey 😉. Hooe you get to read Hope and Tyler’s story soon. I like stories that are based on something personal to you and based on your hearts love. This sounds like such a heartfelt book! It sounds like a true life story that I can’t wait to read. I love Lee Tobin McClain’s books and I am always impressed with her true to life people and circumstances. Thank you, Cynthia. I hope you’re able to read Recovering Hope soon. Thank you for sharing! The excerpt sounds intriguing. Thank you, Linda. Hope you get to read my book. Depression runs in my family. I really want to read this book. Thank you for writing about this subject. That’s tough, Jan. I know. I hope that Recovering Hope will be a blessing to you. I’m thankful for authors who listen to God! It sounds like a wonderful book. I am a depression sufferer and as of right now, I’m not taking medication but that is due to the good Lord. He has pulled me through so much and I’m so grateful. You are in my prayers. Thank you, Debbie. And that is wonderful that you’ve come so far. May you continue to go from strength to strength. Deeply emotional subjects are hard. Depression is a tough subject. I have training in clinical psychology and have soon realized it wasn’t for me to do the therapy side of it, so I just hide myself in a lab doing research about mental health and similar issues. Otherwise I’d just cry with (and for) them. A very tough subject and disease indeed, Priscila. Thank you for what you do in your research. Thank you, Jerilynn. I hope you get to read it. I can’t wait to read this book!!! My mom, my oldest son (21 yrs old), and myself all suffer from depression. I try to keep a good attitude and a good sense of humor. Thank you, Suzie. I’m so sorry about the sudden loss of your husband, and of your babies. I pray that Recovering Hope will be a blessing to you. This sounds like an interesting book. I struggle with depression, too. I’m so sorry that you’re a sufferer too. I pray that you’ll be able to read Recovering Hope and that it will bless your soul. This one is on my TBR Marion, just because it sounds like a wonderful journey! Congratulations on the new release! Yay! I hope you get to read Recovering Hope soon, Teri. Congratulations Marion on your new release!!! I’m sure it’s awesome! Even the blurb had me reaching for my tissue box. Congratulations to our three winners, Teri, Beth, and Kim. Ladies, I’ve emailed you each with the Bookfunnel link to download your copy of Recovering Hope. Happy reading all! And a very merry Christmas to all our Inspy Romance readers.